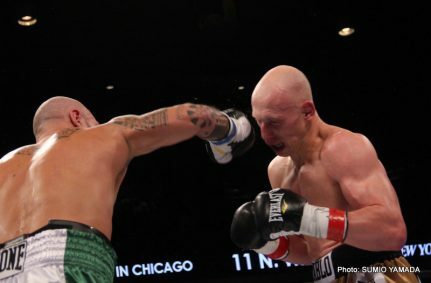 WBC Cruiserweight Champion Krzysztof Wlodarczyk successfully defended his title last night at the UIC Pavilion in Chicago, Illinois. This victory completed his trilogy of fights with Italian former champion Giacobbe Fragomeni and was also his sixth defense of the WBC belt. Wlodarczyk displayed a true veteran’s poise in the ring tonight and put on a flawless performance. Fragomeni was giving up several inches in height and reach but sometimes it felt like a foot. Wlodarczyk’s footwork was also put on display as he rarely if ever let Fragomeni get inside, the only place the challenger could get any solid work in. The highlight of the fight was most certainly the left hook in round four that knocked Fragomeni to the canvas. It was a strange knockdown on a very short punch. The two came close together and the referee came over and it looked like there was going to be a break and Wlodarczyk just threw a punch. Fragomeni went down to his stomach and was shaking his head as the count picked up and it didn’t look like he was going to make it. Fragomeni then sprung up and cut it close getting up at nine. With the little time left in the round Wlodarczyk went on the offensive but he could not seal the deal before the bell. The forty-four year old challenger really showed something by not only getting through the fifth round but put in a game effort in that round. 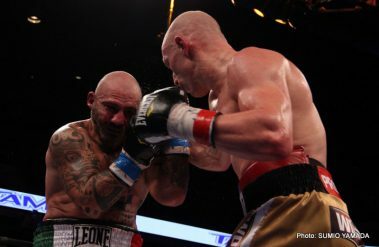 Fragomeni heading into the fight promised an all out attack going into the fight and did his best to stick to the plan. Wlodarczyk to his credit just would not cede him the chance to do so. Fragomeni came in very squared up with his feet close together looking to slug it out. Wlodarczyk used his feet to change direction and create angles. In the first round Wlodarczyk’s jab was coming out in variety with some soft pawing jabs to much stiffer jabs. He also would throw a left hook into a right hook combination trying to get around the guard. This opportunity was set up because the jab was so effective. 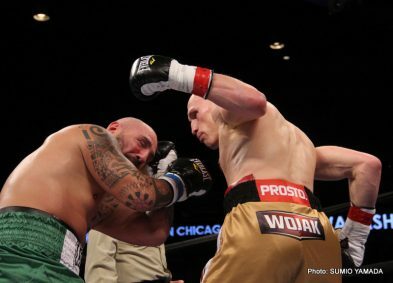 Wlodarczyk’s signature weapon, the left hook, was also put on display even used as a check hook to counter. From the onset the difference in speed was massive and may have had a lot to do with Fragomeni being forty-four but it was a huge difference maker. The body attack was also very impressive for Wlodarczyk who is really turning out to be a great accumulation finisher and he knows how to break a man down. Everything he does in the ring shows a veteran’s intellect and has the basis of bringing an end to the fight. From the pace, the use of the ring, the jab, and the body work all sets up these stoppages that he has had. The fifth round started with the feeling that the fight would end inside the next three minutes. Fragomeni had been down and had been hurt. However, Fragomeni had other ideas as he got inside at times and got in with short hooks inside. It did look as though Wlodarczyk was taking a breather in the round as he did lay on the ropes briefly and Fragomeni got off but with nothing of consequence. The champion did turn Fragomeni, putting him in the corner. Fragomeni was very game after seeming ready to go but did not win the round. 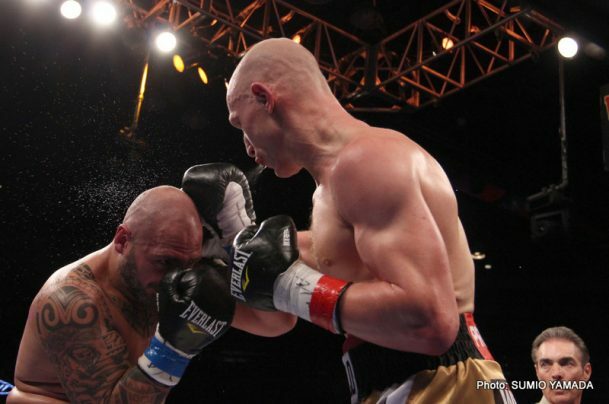 The sixth and final round was a last hurrah for Fragomeni who had been cut since the fourth round under the left eye. It was a very deep cut and the area under the eye was starting to puff up. Fragomeni came out of his corner to make something happen but Wlodarczyk knowing the situation and being a smart veteran gave him no help in there. Wlodarczyk stayed out of range and moved well and made Fragomeni miss. It was a very spirited round for the challenger but it would be his last. The fighter sat in his stool and the doctors came in to have a look at the damage. They saw him as unfit to continue and that was it, the fight was over. In a great display of sportsmanship, Wlodarczyk picked up Fragomeni after hugging him. Two classy fighters, it is nice to see displays like that one. Wlodarczyk appears to still be in his prime at thirty-two years of age. He has over fifty fights but has not been in too many wars and has never been stopped. He has not lost since 2007 and that was to Steve Cunningham in a fight that put USS on the map. The closest he came to defeat was in his most previous fight against Russia’s Rakhim Chakhkiev where he was actually the underdog and took his belt on the road to the challenger’s backyard. After going down in the third and being shut out in the first four or five rounds he managed to stage a great comeback in a solid fight. Wlodarczyk took a severe pounding and was way behind when Chakhkiev started to slow down and the champion came on. He displayed great poise pacing himself and body punching a tiring fighter and bringing the fight to an end. Wlodarczyk also was very impressive going to Australia and knocking out Danny Green late in the fight. Wlodarczyk looks to be at his best and on a roll of defenses. Hopefully we will see more of him in the US and also in a unification match. Wlodarczyk and Marco Huck would be a fun fight. Right before the main event Andrzej Fonfara built off his August come from behind knockout of Gabriel Campillo by knocking out Samuel Miller in two rounds. Fonfara since his debut fight in Poland has fought outside the state of Illinois just once. He has also fought at the UIC Pavilion in six of his last seven and he is turning into quite a draw with the Polish fans. He is being matched wisely having faced recognizable names like Byron Mitchell and Glen Johnson though past their primes. He also faced a former champion in Gabriel Campillo as well as a title challenger in Tommy Karpency who went the distance with Nathan Cleverly. Not sure if this was done as a stay busy fight but this was a massive step back in opposition. Samuel Miller may have twenty six wins next to only eight losses and twenty three wins by knockout but it is not as good as it sounds. Miller has no significant wins and was paired very soft early which created an inflated knockout record. 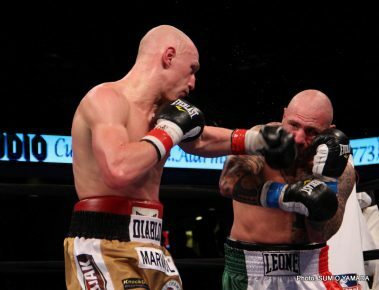 The fight had a wild end as Fonfara was hit by a rabbit punch. Miller got behind Fonfara in almost a Bernard Hopkins like maneuver and was behind Fonfara and hit him in the back the head and had to be separated by the referee. Moments later as the fight was resumed a left hook flew in and dropped Miller for the ten count. Fonfara took care of business in the ring and did what he was supposed to do against an overmatched opponent and what he had to with a dirty fighter. Fonfara however is now highly ranked at light heavyweight in three of the four major organizations. The IBF, WBO, and WBC all have him highly ranked at it is realistic and very likely that he will fight for one of those titles in 2014. The men holding these titles are Russian knockout artist Sergey Kovalev, one punch knockout artist and slick fighting Adonis Stevenson, and the old crafty veteran himself Bernard Hopkins. Fonfara shows no indication of being on their level yet. 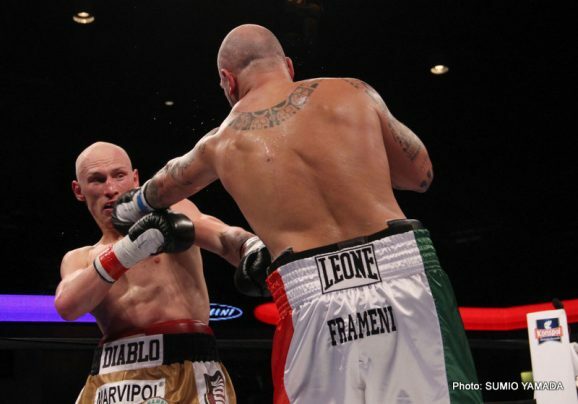 Campillo really showed lots of holes in Fonfara’s game that need to be addressed and this fight did not tell us anything we already did not know. Fonfara is finishing his fights inside the distance and going to the cards less more recently. Maybe he has a punchers chance with all three belt holders.